Established in 2014, the Diefenbunker Artist-in-Residence Program fosters connections between the Museum, local artists, and the wider Ottawa community through the creation and presentation of art inspired by this National Historic Site and its history. After a challenging month of choosing from many interesting and wonderful submissions our selection panel has named our 2019 Artist-in-Residence. It is our privilege to announce that Carol Wainio has been selected as our 2019 Artist-in-Residence. Carol’s work draws together diverse references to investigate and re-stage older visual narratives of transformation and desire, scarcity and excess, often, though not exclusively, drawn from early European fairy tale. Carol is currently a professor at The University of Ottawa in the Visual Arts Department. She has been featured in galleries across Canada and the world. Her work has been shown at the the National Gallery of Canada, the Glenbow Museum, Musées des beaux arts de montréal, and the Art Gallery of Ontario, as well as several international galleries. Carol will begin research for her 2019 Artist in Residency in February with her work culminating in a site-specific exhibition later this year. Congratulations Carol, we’re excited to see what you create! The Museum welcomes one artist per year for a period of 3 to 6 months. The program is open to artists working in all media living within a 100 km radius of Ottawa. Works produced through the residency must have a connection to the Diefenbunker, the Cold War or related themes. The residency is not a live-in opportunity and artists must have their own means of transportation (there is no public transit to Carp). Artists are given full access to the Museum, its library, collection and archives, and on-site work can be discussed. The residency will culminate with an exhibition or a presentation of work completed during the residency as well as an artist-led tour of the exhibition or talk. A project fee will be paid to the selected artist. The Diefenbunker: Canada’s Cold War Museum presents Now You See Me, an exhibition by the Museum’s 2018 Artist-in-Residence, Annette Hegel. Ottawa-based multimedia artist, Annette Hegel, selected as Diefenbunker Museum’s 5th Artist in Residence The Diefenbunker Museum is delighted to announce the results of its Artist in Residence for 2018. Annette Hegel, a multi-media artist who has exhibited her work in Canada and Europe, was selected from several applications from both national and international artists. “We’re really looking forward to having Annette at the Museum,” said Nic Clarke, the Diefenbunker’s Curatorial Manager. “Both her work and as well as her experiences growing up on the frontlines of the Cold War, make her an amazing fit for the Diefenbunker.” “It is a great honour, to be selected and join the ranks of artists in residence at the Diefenbunker,” says Hegel. “For me, particularly, as a politically engaged artist, research and refelction at the Museum cannot come at more opportune time, considering the world-political climate of the last 24 months that should give a certain sense of déja-vu to those of us who have come of age during the Cold War.” Annette grew up in Cologne and Düsseldorf, West Germany and moved to Toronto in the early 1980s to study at the Ontario College of Art (now OCAD University) in the experimental arts department. She returned to West Germany in the mid-eighties and moved to West Berlin at a time of great cultural and political flux that eventually led to the fall of the Berlin Wall in 1989. She co-founded the artist collective that ran the “Weiße Gallerie” (White Gallery), a group of artists that made it their focus to comment on the plethora of political and social issues of the decade that were amplified by the circumstances of Berlin’s role in German and World politics. Annette moved back to Canada in 1987 and is now based in Ottawa, where she was founding member of the Slipstream Collective in 2014. In addition to being a member of the Slipstream Collective, Annette has been a catalyst and facilitator of many community-based public art projects, particularly engaging children and youth. As well as her daily art practise, Annette is engaged in the ongoing collaborative trans-atlantic project “HEGEL,HEGELcontemporary,” which is an experimental visual dialogue with her curator brother Martin who lives and works in Cologne. The Diefenbunker: Canada’s Cold War Museum presents Emergency Broadcast, an exhibition by the Museum’s 2017 Artist-in-Residence, Pixie Cram. The Diefenbunker is pleased to welcome Pixie Cram as the Museum’s 2017 Artist in Residence.Pixie Cram is a filmmaker based in Hull, Quebec. His productions include fiction, animation, documentary and installation. Pixie studied theater and screenwriting at Concordia University in Montreal before making her film debut. She is co-founder of Windows Collective, a group dedicated to the creation and presentation of experimental works using the film. In addition to her own artistic practice, she works freelance as a director, editor and director of photography. Pixie Cram artistic approach, 2016. The vision of the collective is to play with the aesthetics of residential and commercial architectural structures in Ottawa and to reinvent a practice of contemporary mobile urban art stemming from the tradition of cinema. The relationship between nature and technology is a recurring theme in my works. Often, nature dominates and human characters face issues of responsibility. I describe my style as “rustic futurism”, where systems and machines are largely broken and nature inspires a new approach to old issues – a sort of pastoral science fiction. The Diefenbunker: Canada’s Cold War Museum presents The Age of Atomic Anxiety, an exhibition by the Museum’s 2016 Artist-in-Residence, Anna Frlan. “There is something fascinating about going into a building that was once so top secret that very few people had seen it, and even the people who worked there were not familiar with all the areas of the bunker,” said Frlan in a recent article for Canadian Art. Following months researching a wide range of subjects about the Cold War through the Museum’s collection, archives, blueprints, photos and library, Frlan has created a series of sculptures that explore the psychological climate during that era. Occupying several spaces throughout the four storey underground facility, Frlan’s highly detailed works offer a unique perspective on one of the most critical times in the world’s history. Anna Frlan is a sculptor of steel, dedicated to transforming this surprisingly pliable material through a process-oriented studio practice. 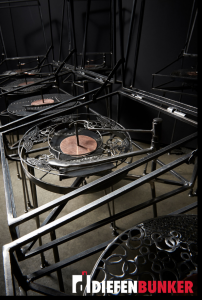 The daughter of Croatian émigrés, her recent work has explored the connection between industrial steel and twentieth-century weaponry production. Frlan holds a Bachelor of Fine Arts from the University of Ottawa. Her work has been exhibited in solo and group exhibitions in Ottawa, Aylmer, Toronto and Croatia, and is found in the collections of the City of Ottawa, Nortel Networks, Deloitte & Touche, and the Canadian Medical Protection Association. The Diefenbunker: Canada’s Cold War Museum presents Geometries and Auralities of Survival, an exhibition by the Museum’s 2015 Artist-in-Residence, Jesse Stewart. “Vertical lines painted on the circular concrete pillars that jut out into the hallways…red stripes painted on doors…concentric circles drawn on maps to indicate the projected survival rates as we move further from the epicentre of a nuclear explosion”. Jesse Stewart was struck by a “visual emphasis on modernist geometric designs” throughout the 100,000 square foot facility. These “geometries” are explored in Stewart’s residency exhibition through photography and the introduction of artifacts from the Museum’s collection. The exhibition also incorporates sound through the documentation of performances and sound installation throughout Stewart’s ten month residency. On the occasion of his exhibition launch, Jesse Stewart will present a free percussion performance in the Museum’s historic cafeteria. Jesse Stewart is an award-winning composer, musician, visual artist, sound artist, instrument builder, writer, and educator dedicated to re-imagining the spaces between artistic disciplines. His music has been performed at festivals throughout Canada, the United States, and Europe and is documented on over 20 recordings. He has been widely commissioned as a composer and artist. He has exhibited visual art in over a dozen solo and group exhibitions at public and private galleries including the Museum of Contemporary Canadian Art, the Karsh Masson Gallery, the Robert McLaughlin Gallery, the Thames Art Gallery, the Glenhyrst Art Gallery, the Peterborough Art Gallery, and the Macdonald Stewart Art Centre. He is the recipient of numerous awards and honours including the 2012 Instrumental Album of the Year Juno Award for his work with genre-defying trio Stretch Orchestra. In 2014, he was named to the Order of Ottawa, one of the city’s highest civic honours. He is an Associate Professor of music at Carleton University and an adjunct faculty member in the department of visual arts at the University of Ottawa. The Diefenbunker: Canada’s Cold War Museum is proud to present the first exhibition of its inaugural Artist-in-Residence Program. To warn other Canadians is the outcome of Gail Bourgeois’ artist residency at the Museum and National Historic Site. To warn other Canadians is a research and exhibition project that will present art works among the museum’s exhibition spaces. The title is borrowed from something said by tour guide and museum Collections Manager, Doug Beaton: The bunker was here to warn other Canadians. This refers to the role the bunker played in housing elements of the federal government in the event of a nuclear attack. Gail Bourgeois holds an MFA from Concordia University. She is a founding member of Powerhouse Gallery (La Centrale) in Montreal and founded or formed part of a dozen artists’ collectives. Her multidisciplinary practice is drawing-based. Her themes and methods of working express the tension between academic knowledge and more experimental forms of knowledge based on her interest in collective practices and community engagement.